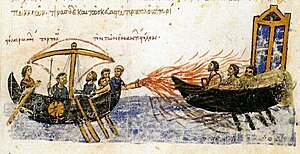 Greeks using their lethal fire, from the Madrid Skylitzes manuscript. The Rus'–Byzantine War of 941 took place during the reign of Igor of Kiev. [n 2] The Khazar Correspondence reveals that the campaign was instigated by the Khazars, who wished revenge on the Byzantines after the persecutions of the Jews undertaken by Emperor Romanus I Lecapenus. The first naval attack was driven off and followed by another, successful offensive in 944. The outcome was the Rus'–Byzantine Treaty of 945. The Rus' and their allies, the Pechenegs, disembarked on the northern coast of Asia Minor and swarmed over Bithynia in May 941. As usual, they seemed to have been well informed that the Imperial capital stood defenseless and vulnerable to attack: the Byzantine fleet had been engaged against the Arabs in the Mediterranean, while the bulk of the Imperial army had been stationed along the eastern borders. Lecapenus arranged a defense of Constantinople by having 15 retired ships fitted out with throwers of Greek fire fore and aft. Igor, wishing to capture these Greek vessels and their crews but unaware of the fire-throwers, had his fleet surround them. Then, at an instant, the Greek-fire was hurled through tubes upon the Rus' and their allies; Liudprand of Cremona wrote: "The Rus', seeing the flames, jumped overboard, preferring water to fire. Some sank, weighed down by the weight of their breastplates and helmets; others caught fire." The captured Rus' were beheaded. The Byzantines thus managed to dispel the Rus' fleet but not to prevent the pagans from pillaging the hinterland of Constantinople, venturing as far south as Nicomedia. Many atrocities were reported: the Rus' were said to have crucified their victims and to have driven nails into their heads. In September, John Kourkouas and Bardas Phokas, two leading generals, speedily returned to the capital, anxious to repel the invaders. The Kievans promptly transferred their operations to Thrace, moving their fleet there. When they were about to retreat, laden with trophies, the Byzantine navy under Theophanes fell upon them. Greek sources report that the Rus' lost their whole fleet in this surprise attack, so that only a handful of boats returned to their bases in the Crimea. The captured prisoners were taken to the capital and beheaded. Khazar sources add that the Rus' leader managed to escape to the Caspian Sea, where he met his death fighting the Arabs. Igor was able to mount a new naval campaign against Constantinople as early as 944/945. Under threat from an even larger force than before, the Byzantines opted for diplomatic action to circumvent invasion. They offered tribute and trade privileges to the Rus'. The Byzantine offer was discussed between Igor and his generals after they reached the banks of the Danube, eventually accepting them. The Rus'–Byzantine Treaty of 945 was ratified as a result. This established friendly relations between the two sides. ^ Sources give varying figures for the size of the Rus fleet. The number 10,000 ships appears in the Primary Chronicle and in Greek sources, some of which put the figure as high as 15,000 ships. Liudprand of Cremona wrote that the fleet numbered only 1,000 ships; Liudprand's report is based on the account of his step-father who witnessed the attack while serving as envoy at Constantinople. Modern historians find the latter estimate to be the most credible. Runciman (1988), p. 111. ^ Some scholars have identified Oleg of Novgorod as the leader of the expedition, though according to traditional sources he had been dead for some time. See, e.g., Golb 106-121; Mosin 309-325; Zuckerman 257-268; Christian 341-345. ^ Mauricio Borrero. Russia: A Reference Guide from the Renaissance to the Present. 2004. P. 389: "941–944: Igor leads expedition on Constantinople". ^ James Stuart Olson, Lee Brigance Pappas, Nicholas Charles Pappas. An Ethnohistorical Dictionary of the Russian and Soviet Empires. Greenwood Publishing Group, 1994. P. 767: "944: Igor ends his expedition against Constantinople". ^ Janet Martin. Treasure of the Land of Darkness: The Fur Trade and Its Significance for Medieval Russia. Cambridge University Press, 2004. P. 115-116: "In 941 and 944 the Rus' again launched attacks on the Byzantine Empire. Although the first was a total failure, the second resulted in a new treaty (945)". Christian, David (1998). A History of Russia, Central Asia and Mongolia. 1. Oxford: Blackwell. ISBN 0-631-18321-3. Golb, Norman; Pritsak, Omeljan (1982). Khazarian Hebrew Documents of the Tenth Century. Ithaca: Cornell Univ. Press. ISBN 0-8014-1221-8. Harris, Jonathan (2007). Constantinople: Capital of Byzantium. London: Hambledon Continuum. ISBN 978-1-84725-179-4. Kendrick, Thomas D. (2004). A History of the Vikings. Mineola, NY: Courier Dover Publications. ISBN 0-486-43396-X. Logan, Donald F. (1992). The Vikings in History (2nd ed.). London: Routledge. ISBN 0-415-08396-6. Mosin, V. (1931). "Les Khazars et les Byzantins d'apres l'Anonyme de Cambridge". Revue des Études Byzantines. 6: 309–325. Runciman, Steven (1988). The Emperor Romanus Lecapenus and His Reign: A Study of Tenth-Century Byzantium. Cambridge University Press. ISBN 978-0-521-35722-7. Uspensky, Fyodor (1997). The History of the Byzantine Empire. 2. Moscow: Mysl. Zuckerman, Constantine (1995). "On the Date of the Khazar's Conversion to Judaism and the Chronology of the Kings of the Rus' Oleg and Igor". Revue des Études Byzantines. 53: 237–270. doi:10.3406/rebyz.1995.1906. This page was last edited on 15 February 2018, at 06:08 (UTC).